A Hostile Takeover Battle in the Oilpatch–How Un-Canadian, eh? A hostile bid in the Canadian oilpatch is…un-Canadian, eh? 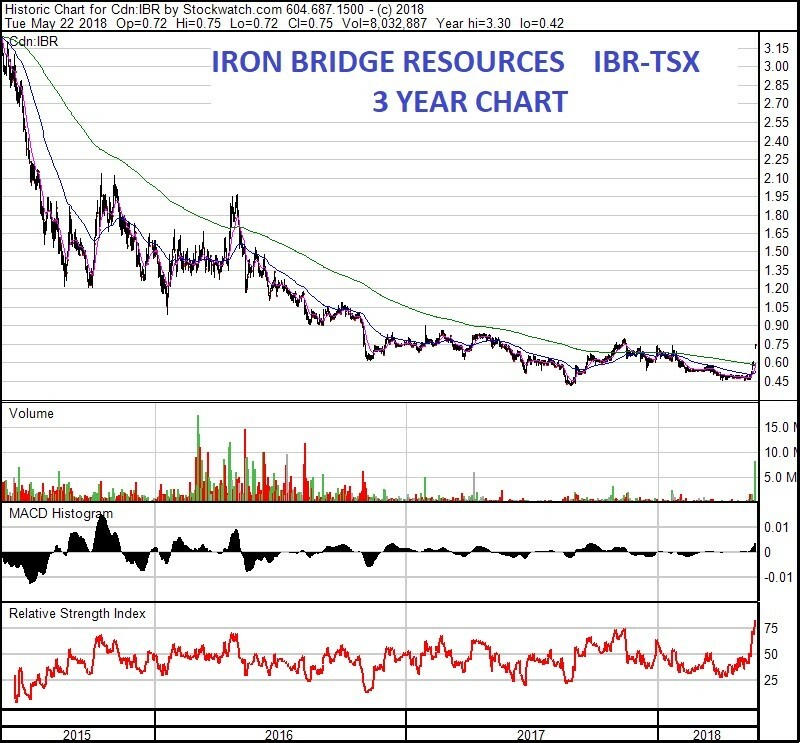 But the industry has one now with private-co Velvet Energy bidding 75 cents per share for Iron Bridge Resources (IBR-TSX; OEXFF-PINK; formerly RMP Energy) in an all-cash deal. It also puts two former colleagues on the opposite sides of the fence: IBR’s CEO Rob Colcleugh and Velvet CFO Chris Theal were both founding partners of boutique brokerage firm Tristone Capital, a highly respected outfit bought out by global giant Macquarie many years ago. The Prize here is IBR’s big land package–almost 50,000 net acres—in the Gold Creek section of western Canada’s Montney play, along the B.C.-Alberta border. Gold Creek is in the liquids-rich zone, making economics some of the best in the country. The Montney is the ONLY hot play in Canada; if you’re producing oil or condensate. Just like down south in the US, time and technology have transformed economics. I’m talking about the same longer laterals and more intense fracking that we all read about in the Permian. IBR just announced a well with an IP30 of 1800 boepd, including 575 bopd of liquids—a highly economic well, and well above the Street’s type curve of just under 1200 boepd. “Liquids” are things like butane, ethane, propane and in Canada, much of it is condensate. Condensate is very valuable in Canada, as it is used to dilute the thick, gooey oilsands production so it will flow better in a pipeline. Most of IBR’s liquids is this very valuable condensate (think of condensate as a super-light oil) which trades at a similar price to oil. Iron Bridge is a very small company; a minnow surrounded by whales. 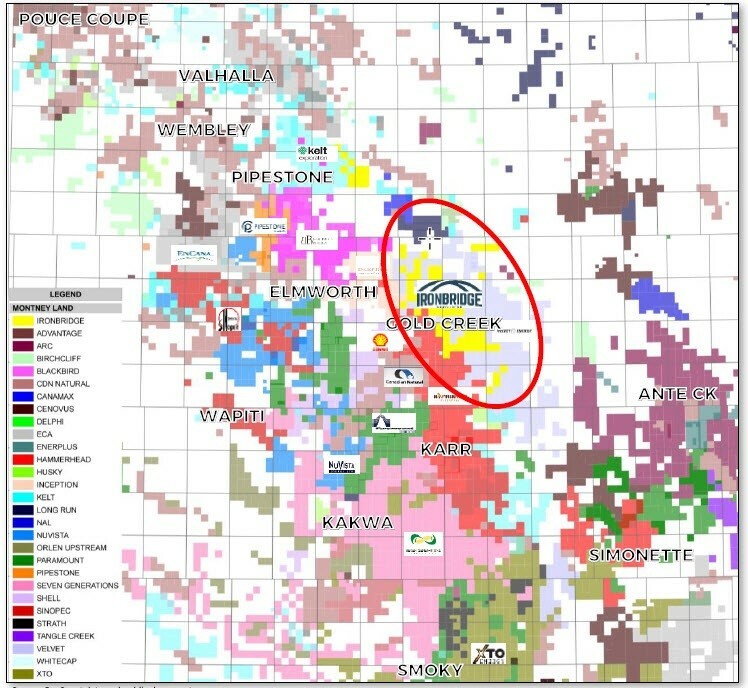 To the SW is another private-co Hammerhead Resources (the big block of scarlet red in the map below), backed by Private Equity giant Riverstone, and to the east is Velvet Energy (the pinkish-grey block in the map below), backed by US giant PE company Warburg Pincus. IBR’s strategy has always been to get bought out, and I have little doubt it will happen with a sweeter offer. The Street agrees, bidding the shares up to this initial 75 cent takeover price before the end of the first day of trading. But the end buyer may or may not be Velvet, as large Montney land packages are rare. The two companies have held informal talks as early as last summer, but IBR felt the bid then was too low (with nobody saying what that bid was…). Between very low Canadian natgas prices and some bizarre pipeline politics, junior Canadian energy stocks fell deeply out of favour with investors since that time. IBR did a great deal last fall, selling one of its non-core assets for $80 million, and giving it a balance sheet with $20 million net cash. The stock doubled from 40-80 cents on that news, but then fell back over the winter. After drilling some wells, they now have $2 million net debt, but CEO Rob Colcleugh says they are now producing at 4000 boepd, and have an annualized cash flow rate of roughly $21 million after their latest well results. At 75 cents and 155 million shares, Velvet says they are valuing Iron Bridge at roughly $120 million. They say that’s a 58% premium to when they put the bid to IBR’s board on May 13, and a 45% premium to Friday May 18 close. Velvet contends their bid is 12x consensus cash flow for 2018, but IBR says that was before the latest wells were added…and they have capacity for 5200 boepd. At $21 million annualized, the valuation is more like 5.9x cash flow. Velvet also talked about high costs per boe (barrel of oil equivalent; this is a way of bringing the oil and gas into one valuation metric), but of course now those numbers get cut in half as well with the new production. And of course smaller companies will always have larger G&A components per boe—by definition. What are Canadian junior gas producers being valued at now? A look at more than 50 gas-weighted transactions going back to 2015—the bottom of the market where economics were much worse than today—shows an average of $57,667 per flowing barrel on assets that averaged 47% gas—very similar to Iron Bridge’s production mix today. The average cash flow multiple was 6.7x. At 4000 boepd, IBR is being valued at $30,000 per flowing barrel and 5.9x cash flow. But that leaves out one very important—in fact, THE most important reason for this hostile takeover—the 50,000 acres (49,600 to be exact). At $1500/acre, that’s $74.4 million or 48 cents a share cash in addition to the 75 cents. The most recent transaction in the area was well over a year ago (when economics were worse…) and it was $1600/acre—and that was for raw land with no proven production on it. Lastly, there are midstream assets there (batteries, which are holding tanks for oil) worth over $20 million as well, and roughly $9 million worth of stock in another producer called Tangle. One other wrinkle…that doesn’t really mean much is that the new management team have 75 cent warrants good for another three years…so every penny over 75 cents they get paid two pennies. However, with the cash that brings in, it’s not dilutive to a bid to any meaningful degree. CONCLUSION—both the math and the Street say another, higher bid is coming, and my guess it’s much closer to $1. Investors have been lukewarm at best towards gas-weighted Canadian juniors, and the industry is now taking advantage of it. The only thing we know for sure; at the end of the day, being Canadian, they’ll all be sorry ;-). This Entire Industry is Running Off a Cliff–Why? A security that entitles the holder to buy the underlying stock of the issuing company at a fixed exercise price until the expiry date.